Indianhead has launched a new small format, long-filler cigar that's value-priced and ideally suited for time-challenged cigar smokers facing increasingly restrictive smoking policies. "With cigar lovers being banned from indoor smoking nationwide, this 4 1/2 x 40 torpedo gives them 15 - 20 minutes of full-flavored smoking enjoyment," says Bill Bock, president of Indianhead, which imports and distributes several lines of premium cigars and other tobacco-related products. "American Stogies have gained a reputation for performance and quality that equals many higher-priced premium cigars, but is surprisingly affordable," says Bock. Break Time is a Nicaraguan puro and - like all American Stogies cigars - is hand made of choice 100% long filler. Premium cigar maker Nestor Plasencia grows all the tobacco and makes the cigars in Esteli, Nicaragua. 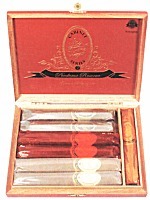 The cigar is available in a choice of three wrappers: Connecticut-seed shade, maduro, and Cuban Corojo. Break Time is presented in boxes of 48 cigars. The suggested retail price is $1.95 per stick. Indianhead, Miami, Fla., Tel: (800) 292-4858, Fax: (305) 623-5494, Web: www.indianhead.cc. Puros Indios Cigars, which earlier this year acquired distribution rights for Cuba Aliados - a premium cigar line the company has produced for decades - has replaced the brand's traditional Ecuadorian-grown Sumatra wrapper with a Corojo wrapper. "We determined the original wrapper gave the Cuba Aliados cigars a flavor profile which was much like our Puros Indios cigars with the same wrapper," explains Carlos Diez, vice president of marketing for Puros Indios. The dark brown wrapper, which has been aged for two years, creates a wider variety in flavor between the two brands. The Cuba Aliados line consists of nine classic Cuban shapes, and is a medium- to full-bodied cigar. The binder remains an Ecuadorian Sumatra leaf, and the proprietary blend includes Piloto Cubano from the Dominican Republic and Nicaraguan tobacco. Rolando Reyes, Sr., the founder of Puros Indios, has produced Cuba Aliados cigars continuously since he acquired the brand trademark in Havana in the 1940s. After making the cigars there for 20 years, he fled Castro's regime, and began rolling them initially in his Union City, N.J. home. Since the 1980s - predating the creation of Puros Indios Cigars - Cuba Aliados had been distributed exclusively by Lew Rothman's J.R. Cigars. The companies agreed to terminate the distribution arrangement in 2004. Reyes manufactures all Cuba Aliados and Puros Indios cigars in a new, modern factory in Danl�, Honduras. The first shipment of the new Cuba Aliados is scheduled for late April. Suggested retail pricing for the line ranges from $3.50 to $8.00. Puros Indios Cigars, Inc., Miami, Fla., Toll-free: (800) 992-4427, Fax: (305) 649-5154, Web: www.purosindioscigars.com. Davidoff of Geneva has added a new figurado shape to its full-bodied Millennium Blend line. The Piramides, which measures 6 1/8 x 52, joins the line's existing four parejo shapes. Millennium Blend cigars are made with a blend of Piloto ligero, San Vicente seco, and Olor seco filler from the Dominican Republic's top growing regions in the Cibao Valley; a San Vicente binder; and a sun-grown wrapper from a tobacco variety grown exclusively for Davidoff in Ecuador. The highly mature wrapper undergoes a supplementary fermentation, and is notable for its darker shade. Among experts, the Piramides format is regarded as one of the classic cigar formats. Its distinctive feature - a head that tapers to a point - can only be made properly by the most skilled and experienced torcedores. The fine drawing characteristics of the tapered head conjure up intense flavors prized by aficionados. Davidoff Millennium Blend Piramides are packed either in elegant, varnished wooden boxes containing 10 cigars ($175 retail) or in attractive cases of four ($70). 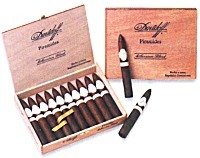 Davidoff of Geneva, Inc., Stamford, Conn., Toll-free: (800) 232-8436. HBI Tobacco has added two new flavors to its category-leading Juicy Jay's line of roll-your-own papers: Mello Mango and Tequila. The new flavors are created with the company's proprietary, trademarked "triple-dipped" flavor system that flavors the entire paper, not just the gum line, delivering an exceptionally intense flavor. HBI Tobacco, Phoenix, Az., Toll-free: (800) 420-4372, Tel: (602) 955-6688, Web: www.hbitobacco.com. Alec Bradley Cigar Company has changed the shape of their Trilogy premium cigar, which was introduced in 2003 with an industry-first head-to-foot triangular shape. The triangular press has been replaced by a conventional round body. "Although Trilogy has thousands of loyal followers, more traditional smokers seemed reluctant to try the unorthodox shape," says Rubin, noting that Trilogy features tons of flavor, consistency, and a price in the $3 range. "We felt we would not lose smokers by giving Trilogy a round body, and would attract many new traditional smokers," says Rubin. The blend and choice of three wrappers and three shapes (robusto, Churchill, and torpedo) remain unchanged. The company has also rolled out new packaging for Trilogy. The two-layer, 10-wide presentation has also been replaced with space-saving cabinet-style boxes, with cigars now stacked in four-layer, five-wide configuration. The new packaging reserves more shelf space for retailers, but not at the expense of Trilogy's nine SKUs, notes Rubin. The black boxes feature color-coded logos corresponding to the three wrapper selections: orange for Exotic Maduro from the Amazon; red for Native Cameroon from Africa (natural); and green for Authentic Corojo (a rich reddish-brown first-generation Cuban-seed Corojo tobacco, grown in Nicaragua). "Now, retailers can attract new smokers, keep the Trilogy regulars, and gain space for more Alec Bradley products," says Rubin. Alec Bradley Cigar Co., Dania, Fla., Toll-free: (888) 426-4397, Fax: (954) 321-9968, Web: www.alecbradley.com. Avo Uvezian has launched his fullest-bodied blend to date with the release of the extremely limited edition AVO LE5 cigar. The tobacco blend selected for this line is notable for the "intensity of its aromas" and its "understated sweetness," notes the brand's distributor, Davidoff of Geneva. Criollo leaf, a Cuban seed tobacco, is used in the filler blend, lending the cigar a rich and spicy flavor. The addition of a specially-cured wrapper results in a cigar of "amazing character." Only 6,000 boxes will be released worldwide. LE5 also departs from other Avo brands in its "from the cigar roller's table straight to the shop counter" presentation. 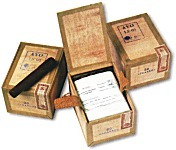 The cigars are packaged in simple wooden boxes in which the cigars are packed immediately after production - in bundles of 20, without a band & wrapped only in paper. The AVO LE5 is offered in a single size, a 5 3/8 x 52 robusto. Suggested retail price for the 20-count box is $240. A 5-bundle bulk box of 100 cigars retails for $600. Following a successful regional market test, Swedish Match North America, Inc., has expanded distribution of its Longhorn Long Cut Mint moist snuff nationally. The new flavor, with a robust peppermint taste profile, began shipping to retail outlets across the U.S. in early April. In less than one year from its national launch in April of 2004, Longhorn has become the 4th largest brand in the "price-value" segment of the moist snuff category. With unique flavor profiles, tobacco blends, and a different price point from its flagship brand Timber Wolf, Swedish Match continues to expand its moist snuff portfolio to reach a wider range of consumers. "We are pleased with the progress of Longhorn and anticipate Long Cut Mint to be as well-received as the brand's current offerings of Long Cut Wintergreen, Fine Cut Natural & Long Cut Straight," said Brian Stankovic, manager of new business development for Swedish Match North America. "The Long Cut Mint segment has grown to become a core flavor in the moist snuff category." Stankovic said the new blend is a great alternative for the consumer whose primary purchase decision is made on price but still wants a quality product. Swedish Match North America, Richmond, Va., Tel: (804) 287-3200, Web: www.swedishmatch.com. Tabacalera Perdomo, S.A. is introducing "shaded" or "tinted" cigar cellophane to its La Tradicion Perdomo Reserve cigar line. The shaded cigar cellophane, which is called CelloSHADE (patent pending), is a proprietary development to help protect cigars from undesirable ultraviolet light conditions and enhance the aesthetic value of the brand's presentation, says Michael Argenti, executive vice president. The decision to implement CelloSHADE was based on a consumer study involving 25 strategically appointed tobacconists located in primary and secondary U.S. geographical markets. The study focused on cellophane used for three editions of the La Tradicion Perdomo Reserve cigar line. The Cameroon line features a platinum tint; the Cuban Caf� utilizes an ivory hue; and the Maduro is distinguished by a deep ruby tone. The newest and fourth edition of the La Tradicion Perdomo Reserve cigar line, Champagne, debuted last year with a golden CelloSHADE sheath encasing each cigar. Tabacalera Perdomo, S.A., Miami Lakes, Fla., Toll-free: (877) 473-7366, Tel: (305) 627-6700, Web: www.perdomocigars.com.